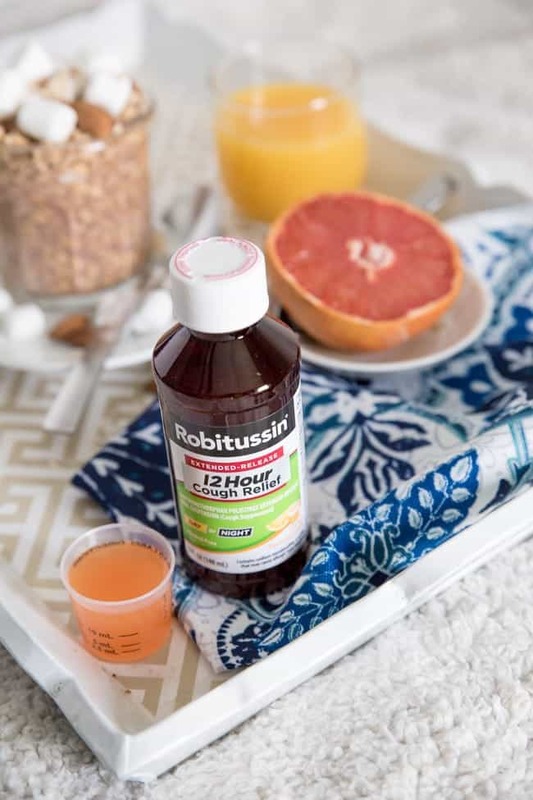 THIS POST IS SPONSORED BY ROBITUSSIN AS A PART OF A SERIES FOR SOCIALSTARS. THANK YOU FOR ALLOWING ME TO CONTINUE CREATING GREAT CONTENT FOR YOU BY SUPPORTING PARTNERSHIPS WITH SUPER AWESOME BRANDS THAT HFHL LOVES TO WORK WITH! AS ALWAYS, OPINIONS REMAIN 100% MY OWN. I haven’t been sick in forever! Sure, headaches still come and go. I did get a 24 hour flu in September (on my birthday!). BUT I haven’t had an ugly cold in the longest time! It used to be that I’d get a sore throat, stuffy nose, and cough about once every few months. This was all while I was working in an office and we all just passed germs around like we were playing hot potato. There was always one guy. He’d start the whole cycle. As soon as he got sick, which was often, we all knew it was just a matter of time before we got our dose. There was nothing you could do to avoid it. But I haven’t worked there for over 18 months. Now that I’m working in the comfort and protection of my own home, I’m insanely lucky to say that I haven’t had a cold in that long. It’s been wonderful! That is, until the last week. It all started over winter break. My son ended up with a fever, congestion, and a horrible cough. That took about 2 weeks to get rid of completely. 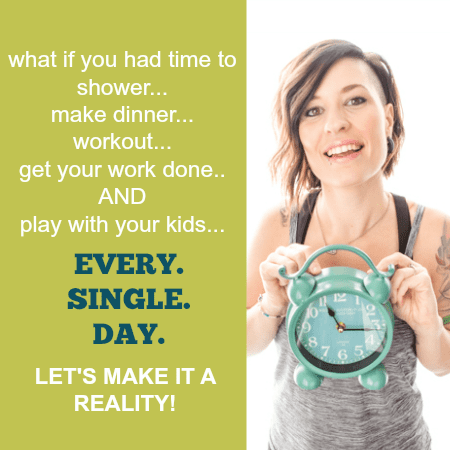 And then about a week later, my wife came home from work all stuffed up and feeling crappy. Nope, I was gonna fight it. I wasn’t gonna catch it. I did everything I could. I asked my friends for their best “nip it in the bud” remedies. Everyone came out of the woodworks to tell me how to get rid of my cold before it hit me hard. But then it happened. None of those remedies actually worked for me. I was long overdue to get a cold, and a cold I got… and then some. I was pretty much hit with the mother of all colds that landed me in bed for the better part of all last week. I had to sleep with my mouth open cause I couldn’t breath. My throat was on fire. And the all-day-all-night coughing. Oh the coughing. 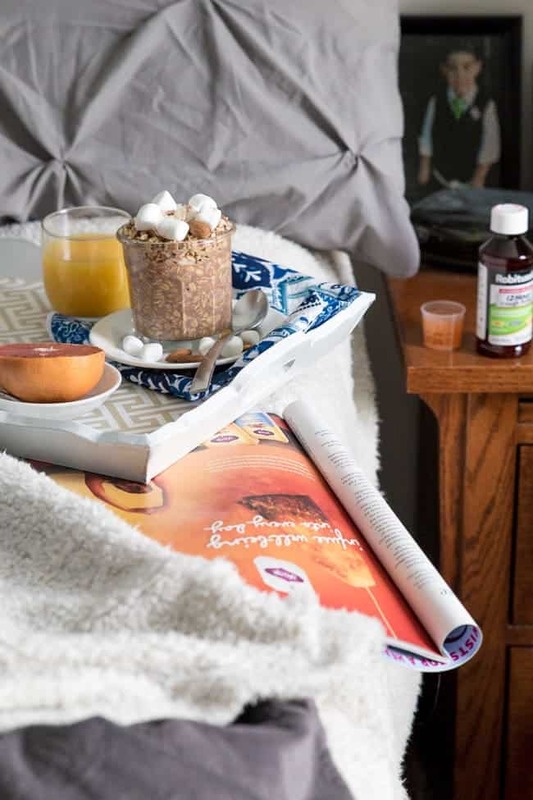 Let’s just say that my wife was absolutely sick of the sound of my annoying cough and gladly brought me Robitussin 12-Hour Cough Relief along with breakfast in bed. She knew I was feeling crappy so she pulled out one of my favorite comfort foods, overnight oats, that I had made earlier in the week. 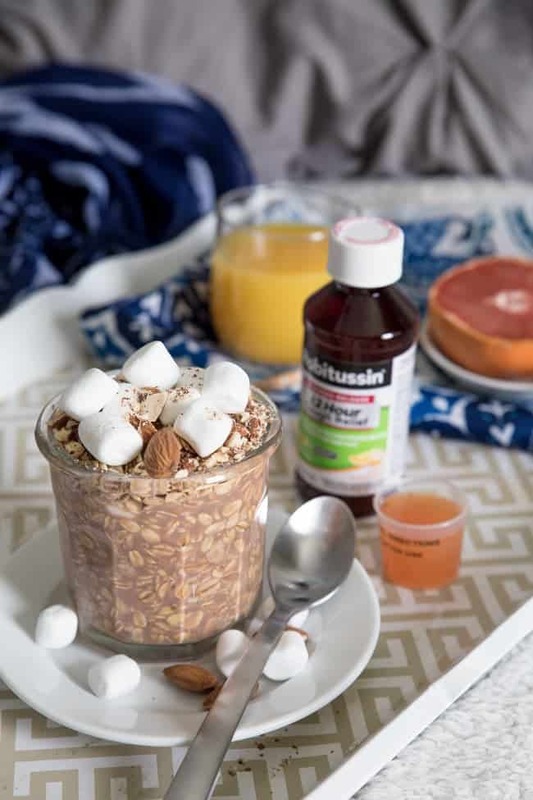 Those dessert-inspired Rocky Road overnight oats paired with some vitamin-C-filled fruit, juice, and the Robitussin were exactly what I needed to start feeling better. She also knew to bring me a magazine, prop up my pillows for me, and hook me up with a Netflix binge of The OA. I don’t really know how I got so lucky being that my cough pretty much made her want to put a pillow over my head all night long. And the thing is, it wasn’t just a cough. It’s never just a cough, is it? The cough was paired with nasty stuff in my chest, aches, and pains, and all the horrible parts of getting sick. It ended up making my throat raw and sore. The good thing though is that I’ve seemed to get a pretty good ab workout from it all! Thankfully, Robitussin Cough Relief is some pretty powerful stuff. I was able to fall asleep much quicker than normal because it gave me relief from all the coughing. Just 10 mL every 12 hours and I felt like I could actually get a break from all the coughing! It comes in both grape and orange flavors, but I opted for the orange. And now that I’m feeling better, I’m feeling much more equipped to tell you all about these heavenly oats. I mean, really, have you ever wanted to eat dessert for breakfast? Is that just a dumb question? 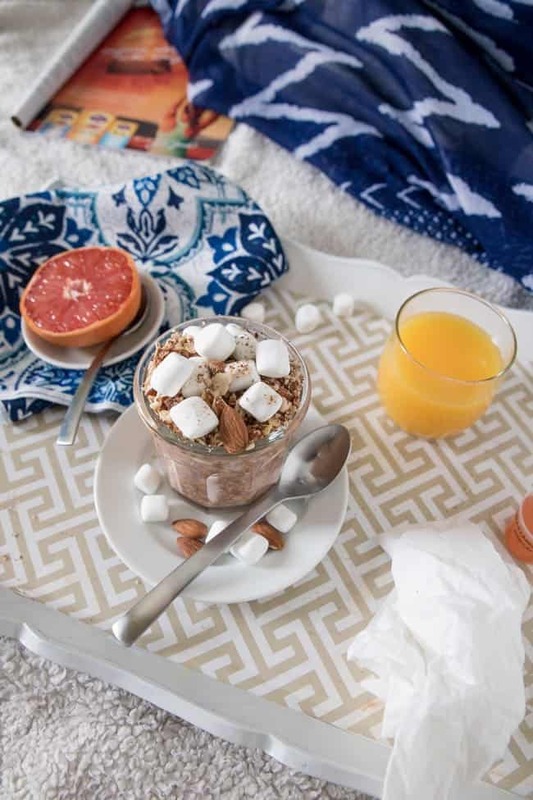 Let’s talk about this rocky road situation we have going on for BREAKFAST. I mean, are you kidding me?! 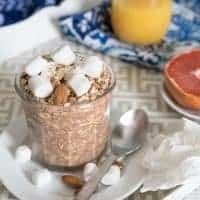 Rocky road ice cream meets simple overnight oats in a mashup that is sure to exceed your highest expectations. It’s crunchy. It’s chewy. It’s sweet. It’s chocolatey. And it’s HEALTHY! 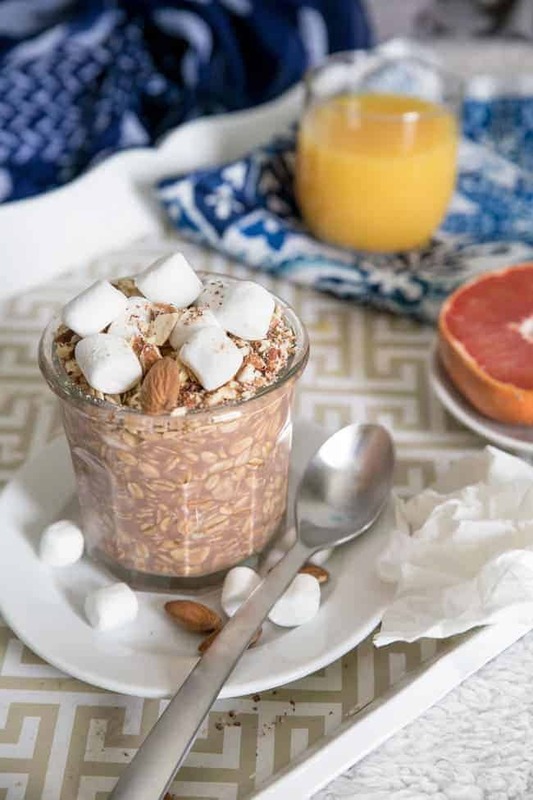 A mashup between rocky road ice cream and healthy oatmeal for breakfast. The crunch of almonds, the soft chew of marshmallows, and the chocolatey sweet base you love in rocky road ice cream. 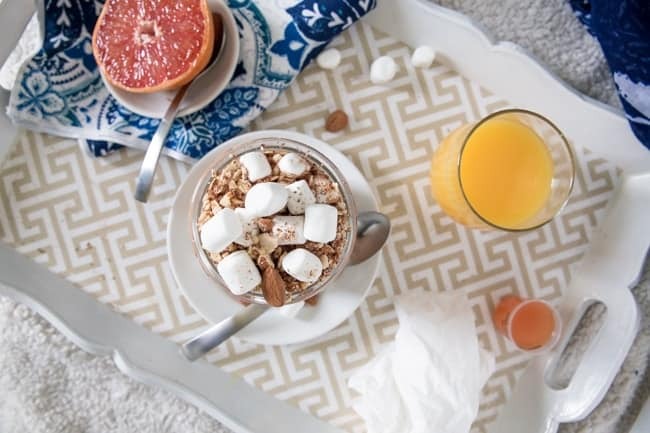 All this served up as a healthy breakfast with a desserty twist to start your day off right. 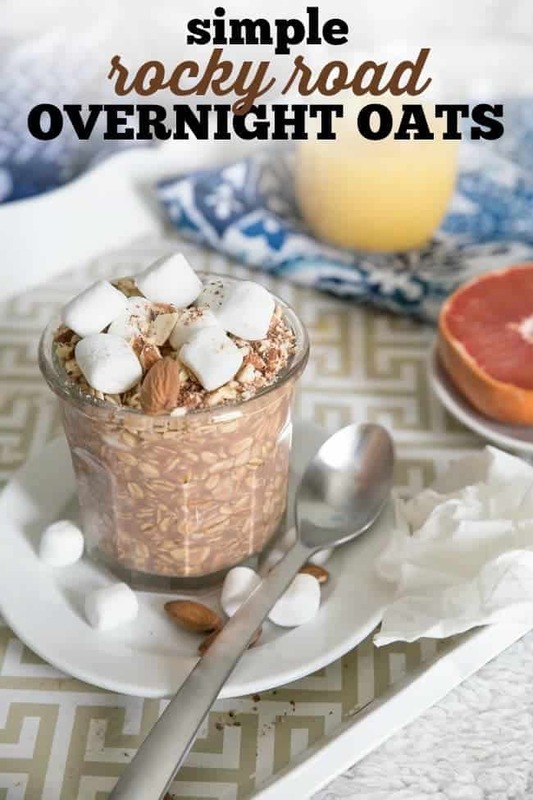 Combine half the oats and chocolate almond milk in the bottom of a jar. Add almonds and mini marshmallows. Top with remaining oats and almond milk. Refrigerate for at least 3 hours, preferably overnight. When ready to eat, stir ingredients and top with additional almonds and mini marshmallows. Will stay fresh in the refrigerator covered for 2-3 days.